Our range of products include filter perforated tubes for automobile industry. With our rich industry experience, we manufacture and supply an extensive range of Filter Perforated Tubes For Automobile Industry. The offered perforated tube is used in dyeing machines, cheeses for o/end & jet spinning, twisting and winding machines. 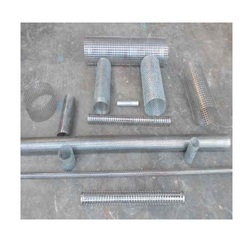 Offered perforated tube is available in several specifications as per the needs of customers. Additionally, our offered perforated tubes find their wide applications in oil, chemical, mining, refining and automobile industries for the filtration purpose.. Looking for Filter Perforated Tubes for Automobile Industry ?